The Swimtastic Aqua Pilates Method - the art and science and transformation of the mind and body through the use of a warm water pool and self resistance. A focus on breathing is included since it is a critical component to the method. Human anatomy and physiology are not covered in detail, but a more in-depth knowledge and study of these areas are important to you as professionals and enthusiasts who desire to pursue Aqua Pilates further. A lifetime experience with dance, ballet, professional theater, cheerleading, swimming, Swimtastic, knowledge of water movement, human kinetics, and an in-depth study of the mind body connection the Swimtastic Aqua Pilates Method demonstrates the influence of the art and science and transformation of the mind and body, incorporating Western philosophies. Swimtastic Aqua Pilates was created for children, teens, adults and seniors, with the basic foundation that exercise can be simple, fun and effective. 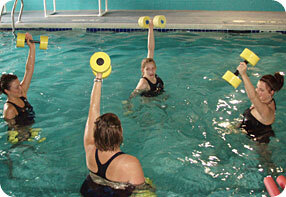 Providing basic information of the body, the movements and terminology created are easy, fun and provide optimal health benefits due to the pool’s 90 degree water temperatures while incorporating the use of steps and pool aides that create added resistance in the water as opposed to typical mat and floor based classes. Swimtastic Aqua Pilates is designed to condition the entire body, which helps increase flexibility, core strength, balance and stability. The exercises created help achieve maximum movement and assist in maintaining correct body alignment. Swimtastic Aqua Pilates is as beneficial for an eleven year old to an 80 year old and as motivating to men as for women. Our Aqua Pilates Program is as flexible and adaptable to someone such as the elderly who are unable to get comfortable in any type of exercise location as it is to someone simply seeking to look and feel great. Our Aqua Pilates is for the young athlete who desires to run faster, decrease injuries and minor sprains as it is for the mom or dad who want to function at optimal health levels and have more increased energy. Swimtastic's Aqua Pilates Program is for the world class athlete who wants to perform to win the next victory by incorporating more strength and flexibility. Basically, Swimtastic Aqua Pilates is for everyone! We offer a FREE trial for the first class, come try it out! Absolutely no obligations or strings attached. The first class is completely free. Hover over the location & schedule tab along the top and select your local Swimtastic to view current Aqua Pilates availability specific to your nearest Swimtastic facility. Not all locations offer Aqua Pilates, so make sure to check your local location page for times and availability. To reserve your free trial class or for help finding Aqua Pilates times, simply fill out our contact form or give us a call at (888) 549-SWIM (7946). Schedule your free trial class today!